Africa: Prosecuting the powerful: will justice ever be done? 2013 was the year in which efforts to prosecute political leaders for their alleged involvement in international crimes seemed to reach a peak. By mid-2013, current and past presidents (and deputies) from several African countries had been indicted at international and regional level. If international criminal justice were to be measured on court rolls alone, 2013 would have been heralded as a year in which justice showed that no one is above the law. Nevertheless, little progress, if any, has been made in any of the cases. In fact, 2014 began with more delays and uncertainties around whether justice would be served in cases against the politically powerful. The International Criminal Court (ICC) currently has seven senior politicians on its court roll. The first, former deputy president of the Democratic Republic of the Congo and alleged president and commander-in-chief of the Mouvement de libération du Congo (Movement for the Liberation of Congo), Jean-Pierre Bemba Gombo, was indicted for war crimes and crimes against humanity committed in neighbouring Central African Republic (CAR) in 2002 and 2003. At present, Bemba is the only suspect accused by the ICC of committing international crimes in the CAR, however there are ongoing investigations that may lead to further indictments. Bemba’s trial, which began in earnest in 2010 following his arrest in Belgium, has suffered several setbacks. These include multiple delays and allegations of tampering. In November 2013, Bemba, together with members of his defence team, was charged with offences against the administration of justice – including presenting false or forged evidence and corruptly influencing a witness to provide false testimony. This is the first such case before the ICC. The second, Omar Hassan al-Bashir, President of Sudan, remains at large following two warrants for his arrest on charges of war crimes, crimes against humanity and genocide in Darfur. That Bashir has managed to evade justice is in large part due to the African Union (AU) July 2009 resolution not to cooperate with the ICC in arresting him. As the first sitting head of state to be indicted by the court, Bashir has been the proverbial thorn in the side of international criminal justice. In the absence of dedicated law enforcement capacity, the ICC relies on national police to arrest suspects. This has proved difficult, if not impossible, where the AU calls on member states not to cooperate in the arrest of presidents. The AU argues that as a president, the accused enjoys immunity from prosecution, which has led to al-Bashir being shielded from prosecution. The third, former president of Ivory Coast, Laurent Gbagbo, is on trial for his alleged role in the crimes against humanity committed following the 2010 Ivorian general elections. Arrested and surrendered to the ICC in 2011 by Ivorian police, Gbagbo is the first former head of state on trial at the ICC. His trial has, however, been riddled with delays and allegations of victors’ justice. The latter has fuelled a shift in sentiments in his country, with some people now calling for his release. Then there are the cases against President Uhuru Kenyatta of Kenya and his Deputy, William Ruto, who are charged for their involvement in the violence that ensued following disputed elections in Kenya at the end of 2007. The violence, which lasted two months, left over 1 100 people dead and many more injured. Kenyatta and Ruto, who were reportedly at opposite sides of the violence, formed a strategic alliance ahead of the 2013 presidential elections. This alliance is proving successful for both as they buttress their support at home on a wave of anti-ICC sentiments. Kenyatta’s trial, which was set to commence on 5 February 2014 after several delays, will now begin at a yet-undecided date following the cancellation of the commencement of trial by the ICC. Analysts predicted that there would be several further delays to Kenyatta’s trial, amid continued criticism from Kenyan victims’ rights groups that such delays would dilute justice – if at all it would be served. Sixth is Saif al-Islam Gaddafi, the de facto prime minister of Libya during the armed uprising of 2011. Gaddafi, who is charged both by the ICC and Libyan authorities, has been the subject of a legal battle for primacy between three institutions: the ICC, Libyan authorities and the Zintan militia who have him in custody. His ICC defence team believes Gaddafi will not receive a fair trial in Libya and that he is likely to be executed if convicted. His Libyan trial is set to commence in February 2014. Gaddafi’s co-accused, former intelligence chief Abdullah al-Senussi was transferred to Libya for trial from Mauritania. The ICC has ruled that Libyan authorities can try al-Senussi. Meanwhile, Senegal, working together with the AU and with the support of the Economic Community of West African States (ECOWAS) commenced the long-awaited trial of deposed Chadian leader, Hissène Habré. Habré, who fled to Senegal after he was removed from power by a military coup, is accused of war crimes and crimes against humanity during his presidency. 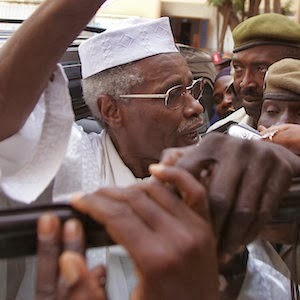 Significantly, Habré’s is the first trial of its kind on the African continent, where a former African head of state is being tried in another country by a court established in collaboration with the AU. Tellingly, as a former head of state, Habré is not detained in one of the lower-end public prisons; but instead at the newly renovated facilities at Cap Manuel. It is yet to be seen whether these cases against heads of states (past and present) will amount to much. The AU has condemned the ICC for indicting heads of state and this has made it difficult for the ICC to proceed in several cases. In its most recent decision, at an extraordinary summit of heads of state in October 2013, the AU lambasted the ICC and reiterated its stance of non-cooperation in respect of cases involving presidents. This position prompted Kofi Annan, the former Secretary-General of the United Nations, to criticise African heads of state for undermining international criminal justice and sending the wrong signal about Africa’s commitment to protect and promote human rights and reject impunity. Given the challenges encountered up to now, one thing is clear: prosecuting powerful leaders is no easy task. This should not dissuade those seeking justice for international crimes; there have been important successes, such as the prosecution of former Liberian president Charles Taylor. Perhaps 2014 will be the year in which justice is finally done.